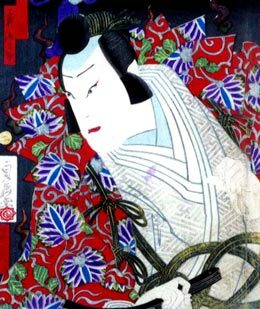 The actor Mimasu Daigorô IV held the name of Mimasu Gennosuke I from the 11th lunar month of 1822 to the 12th lunar month of 1845. Born in 1818. 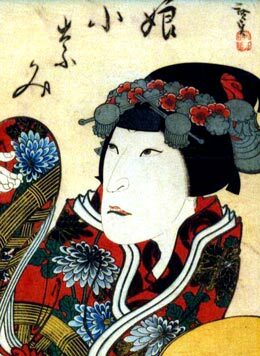 He started his career as a disciple of Arashi Sangorô IV, who gave him the name of Arashi Sankichi II around 1824. He learnt the art in hama shibai and joined for a while the actor Onoe Tamizô II, performing with him under the name of Onoe Takozô. He went back to the Arashi clan and took the name of Arashi Umatarô II at an unknown date. He finally was allowed to take the name of Arashi Sangorô V in 1847, ten years after the death of his master, but held it only for one little year as he was adopted by Mimasu Daigorô IV in Fall 1848. He took the name of Mimasu Gennosuke II in the 11th lunar month of 1848. This hama shibai died in Ôsaka the 15th of the 2nd lunar month of 1861. 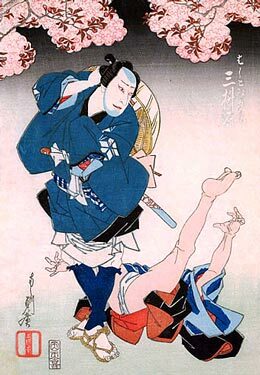 He was able to perform a wide range of roles, as a katakiyaku, a dôkegata, a wagotoshi, a jitsugotoshi or an onnagata but he never really achieved a great fame in Kamigata. The actor Nakamura Sôjûrô held the name of Mimasu Gennosuke III from the 8th lunar month of 1860 to the 12th lunar month of 1864. Dates of birth and death unknown. Son of Mimasu Daigorô IV and brother of Mimasu Gengorô I. His first stage name was Mimasu Takegorô. He started to perform in kodomo shibai in the middle of the 1850s. 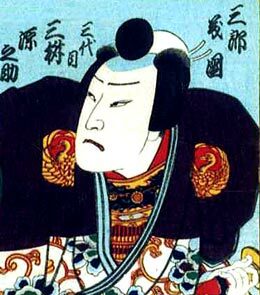 He became disciple of Arashi Rikaku II and received the name of Arashi Rishô I during the Bunkyû era, after the death of his father in 1859. He went back to the Mimasu clan and took back the name of Mimasu Takegorô. He was allowed to take the name of Mimasu Gennosuke IV in the 2nd lunar month of 1865 at the Kado no Shibai, playing two roles in the new year drama "Keisei Soga Monogatari". He finally took the name of Mimasu Gengorô II in October 1884 in Ôsaka at the Bentenza. He appeared on stage for the last time in January 1888 at the Bentenza. We don't know what happened to him afterwards for he disappeared from the records. A rumor said that he most likely died in 1892 in Ôsaka. He was a versatile actor, able to play male or female roles depending on the needs of the production. His field of excellence was jitsugoto.